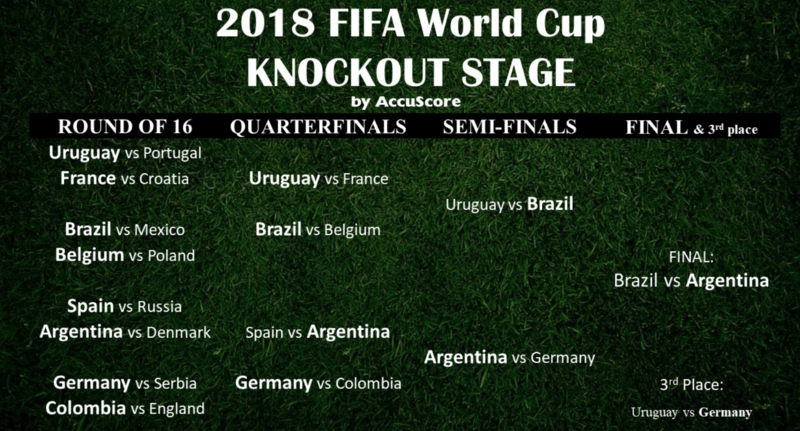 Sports forecasting software Accuscore seeks to repeat its World Cup 2014 success, outperforming financial powerhouse Goldman Sachs in predicting Russia 2018’s match outcomes, individual team performances and eventual winners. Keeping up traditions, this week Goldman Sachs the world’s leading investment bank released its World Cup Russia 2018 forecast, which has been developed internally by its analysts running ‘200,000 models and over 1 million simulations’. Presenting its results Goldman Sachs believes that Russia 2018, will be won by pre-market favourites Brazil (4/1), who are set to meet Germany 9/2 second favourites in the final (15-July Moscow). However, California-based Accuscore believes that Goldman Sachs is being too conservative in their forecasting of Russia 2018 models, favouring pre-tournament pricings over tournament conditions. Accuscore, whose sports forecasting and predictive analysis has been used by a number of tier1 bookmakers, media owners and sports leagues believes that Russia 2018 will favour South American teams. However, whilst Accuscore forecasting predicts that Brazil will make the final, the company believes that Argentina, a team predicted to ‘significantly underperform’ by Goldman Sachs will be the World Cup 2018 winners. Accuscore’s Russia 2018 models have been backed by CEO & Founder Tuomas Kanervala, who points to the firm’s winning performance during Brazil 2014, in which Accuscore outperformed Goldman Sachs in picking group qualifiers (Accuscore 10 – Goldman 9) and the eventual winner Germany.